If coming from the south the natural starting point for this climb is in Prato all’Isarco/Blumau (325m) east of Bolzano. The main road via Aicha/Aica is the easiest choice, but even this road is steep. The old road is the classic one (which I still have to do myself) with 24% ramps. If coming from the north down from Telfen, then you can take off on an initially steep (ramp up to ca. 24%, even if sign says 27%) road to Prosels/Presule (716m) and then join the main road to the pass. 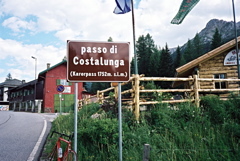 For completeness sake you can climb this pass directly from Kardaun/Cardano (286m) on the same road through the Eggental/Val d’Ega as one would climb when going to the nearby Jouf de Ciareja/Karerpass/Passo di Costalunga (1750m). (You can take the short-cut through the hotels in Karersee/Carezza al Lago to the Nigerpass road, but have not used that road myself.) You then climb to 1773m and descend to the pass.